“Herbie and The Mwandishi Band were booked to headline a week of 16 shows in Los Angeles at the famed Troubadour club as part of their newly designed and expanded touring regime: rock clubs and college campuses. The nominal opening act was a newly signed group from San Francisco, the Pointer Sisters. David Rubinson managed and produced both the Pointers and Herbie, so it was only natural for one hand to help the other. From the opening notes of the Pointers’ set, there was an immediate ecstatic reaction from the crowd, and by the end of their short set the audience was standing on its feet wanting more. As The Mwandishi Band played its set, some of the audience was baffled and a few people began to leave the club (well documented in a review that appeared in Down Beat magazine in the summer of 1973). Herbie was struck by the energy and connection the Pointers had with the people, and resolved to find a way to reach a wider and more enthusiastic audience. Coupled with the financial strain that the septet was causing, plus Herbie’s growing spirituality and awareness of cause and effect, Herbie made a conscious decision to take his music in a new direction. He and Rubinson created a new band, retaining Bennie Maupin from The Mwandishi Band, and hiring jazz/funk electric bassist (and former jazz organist) Paul Jackson from Oakland, Afro-centric multi-cultural percussionist Bill Summers from New Orleans, and Harvey Mason on drums, a star of the Los Angeles studio scene. This newly formed quintet played low profile performances around Los Angeles and the Bay Area during the summer of 1973 and then went into the studio soon afterward to record the now-classic Head Hunters. By the end of 1972, my feeling was that the sextet had reached a peak, and it sustained that peak for a while, and we tried to go beyond that, but it was like fighting uphill. We had found a way to make this music happen, that is, each musician kind of finds a way to get a real rapport going, a certain musical direction. But the sound wasn’t going any further and it just wound up (to me) less focused. We lost the connection somehow. I suspected that my own energy needed something else. It was more spiritual, and it had more to do with me as a human being. I began to feel that I had been spending so much time exploring the upper atmosphere of music and the more ethereal kind of far-out, spacey stuff. Now there was this need to take some more of the earth and to feel a little more tethered; a connection to the earth. People were evolving. We began to hear jazz artists’ interests, including and paying attention to Rock-and-Roll, including that into whatever they were doing. It was a musical reality that was happening, and jazz musicians could take almost nothing or anything and make music out of it. It’s the nature of jazz to take almost nothing, and develop it, and make something out of it. I was beginning to feel that we (the sextet) were playing this heavy kind of music, and was tired of everything being heavy. I wanted to play something lighter. We had this music that we were doing, and the thing was, how could we take this music in a new direction by making it more palatable, but still keep this essence of our original philosophy? The answer was not so much to add a balance of stuff from Rock or R&B, although we touched on this with the albums Crossings and Sextant. It happened one day. I was chanting. I knew I didn’t want to play the music I had been playing, but I didn’t know what music I wanted to play. I hadn’t quite figured it out. I don’t remember having any other idea, but what was uppermost in my mind was that I knew didn’t want to play what had been playing. I wanted to feel more earthy and be a little more grounded. I wanted to find the answers within myself. This is the album that busted it all wide open for an entire generation of jazzoids. Myself included. 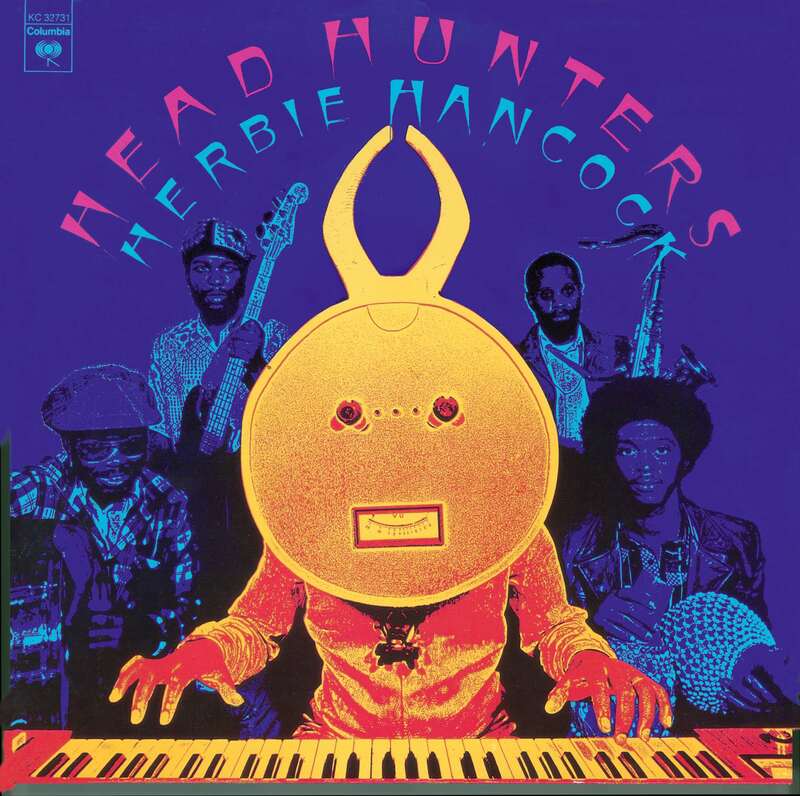 The largest selling jazz album in history, Head Hunters now enjoys platinum status. But more than that, it sounds as fresh and funky as it did nearly two decades ago. Born April 12, 1940 in Chicago, Herbie Hancock began studying piano at the age of seven. Classically trained, he later formed his own jazz ensemble in high school. Eventually he was giggin’ with Coleman Hawkins and Donald Byrd. In 1963, Herbie hooked up with Miles Davis. Head Hunters was the vehicle that opened the eyes ff many to jazz. It was a funky crossover bridge to the other side. It never ceases to amaze me, the full circle music (life) can take. Keyboard master Herbie Hancock provided us with the classic jazz standards “Maiden Voyage” (his own personal favorite) and “Dolphin Dance.” Yet the boundaries of his creativity have no limits. Produced by David Rubinson/Herbie Hancock for David Rubinson & Friends, Inc. Recorded August – September, 1973 by Fred Catero and Jeremy Zatkin at Wally Heider Studios, S.F. and by Dane Butcher and John Vieira at Different Fur Trading Co., S.F. Billboard chart info. – Pop 13, 47 wks; R&B 2, 46 wks; Jazz 1 R.I.A.A. ARP Odyssey – ARP released this analog, duo-phonic, compact studio version of the 2600 which featured the synthesizer and keyboard together as one piece of equipment. Herbie played this instrument on his album Head Hunters in 1973. Minimoog – First released in 1970, this monophonic analog synthesizer offered musicians a synthesizer they could easily take on tour for live performance because of its size and durability. This instrument was also known for its ability to produce rich bass sounds and was often used as the ‘Minimoog Bass.’ You can hear it in the famous bass line that opens “Chameleon” (Head Hunters). ARP Soloist – ARP’s monophonic analog synthesizer featuring 30 preset sounds and designed to sit on top and accompany an organ. This instrument can be heard on several of Herbie’s albums including Head Hunters.